So you've heard all of your neighbors talking about the races they are signing up this year, and last year you thought about signing yourself up for your own 5k (then never got around to it). Don't be caught sitting on the sidelines this year wishing you were out there running with them! Make it happen for yourself, and sign up to run one of the beautiful Utah Valley race courses. Trust us when we say that you will be more than glad you that you did. Nothing really is more fulfilling, healthy, enjoyable, and memorable than running a race on a beautiful morning. Races are also great events for kids! Most races have short kid's length courses and healthy snacks at the end. Starting this Saturday, there are races galore! This picture below tells you all of this week's events. However, some of us may require a little bit of time for training. That's ok! 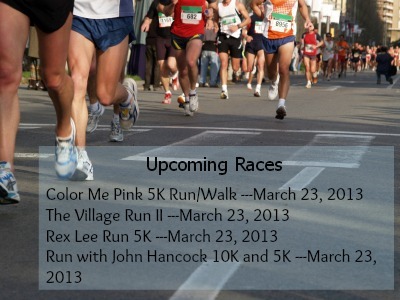 This link http://bit.ly/15YmJ1o takes you to a page full of races around Utah Valley happening up until June 2013. Hop on over and pick out your race today. Remember, if you sign up now, you are more likely to stay committed! To see more information on the races above, visit this link http://bit.ly/Y6dB5p.